We are officially on the road to WrestleMania! The 2018 Royal Rumble is in the books and there is a lot to cover. I will offer my opinions and thoughts on topics from time to time and I would like to start off by thanking you for taking the time to read and reflect with me on the Rumble. Going into Sunday I wasn’t to sure how I felt about the 2018 Royal Rumble. Sure it will be historic with the first ever Women’s Rumble match but WWE doesn’t have a great track record with Rumbles lately. Plus, the night before, NXT put on a killer show (as always) which had an early front runner for MOTY with Johnny Gargano and Andrade “Cien” Almas tearing down the Wells Fargo Center in Philadelphia. I watched NXT late, after the live feed went off the air, because 3 Count Thursday was booked on a gig in Delaware which took place the same time. When I watched, NXT obliviously delivered. So naturally (according to the Internet Wrestling Community, IWC for short) the feeling post NXT and pre WWE pay per view, is “Top That Vince…” And rightfully so in my opinion. The guys and girls in NXT are killing it and deliver every Takeover, so kudos goes out to that group. But this isn’t about Saturday, this is about Sunday night! The Royal Rumble! The start of the Road to WrestleMania! The night started with 3 matches on the WWE pre-show which started at 5pm. The opening match on the pre-show was a 205 Live match featuring Kalisto, Gran Metalik and Lince Dorado vs. TJ Perkins, Jack Gallagher and Drew Gulak. I can only assume this match was thrown together in the wake of the Enzo Amore accusations and following his release from WWE. While I regularly enjoy the 205Live action, this match left me wanting more. The good guys get the win when Kalisto pinned TJP after the Salida del Sol. These guys had zero representation in the Royal Rumble match which is a shame as well. Match 2 saw the Revival battle Anderson and Gallows in a follow up to the disaster that was Raw 25. (refer to January 25th podcast in the archives) After The Revival took every members finisher from DX on Raw, they stood victorious over The Club to help kick off the show. Nothing to get excited about in this match and the crowd seemed disinterested as well. I hope we can see a program with these 2 teams in the future that will lead somewhere and not just wasting talent. Match 3 was a match that I was looking forward to since it was announced! GLORIOUS Bobby Roode United States Championship open challenge match will surely be the match of the pres-how and potentially a show stealer if the right person answers the challenge. Well, my hopes were dashed quickly as Mojo Rawley answers the call. (ugh) This match seemed botchy at best and the slow pace killed all momentum coming out off the pres-how matches into the final 10 or so minutes to sell the PPV. What is with the WWE and their love for Mojo? It is Gronk? It has to be right? So it is safe to say the before the actual Royal Rumble begins, the WWE didn’t give me a lot to cheer for or feel good about going into what is usually one of my favorite PPVs. So, here we go! We start off the night with AJ Styles vs. Kevin Owens and Sami Zayn for the WWE Championship. I personally loved the opening of this match. Owens and Zayn exchanging quick, unnecessary tags, simply because they can was a great tactic to get into the head of Styles. There was a few really good spots in this match, one that sticks out is the hurricanrana by Sami on a flipping Styles off the ropes. The match told the story well of Styles being handicapped by his own arrogance by Owens and Zayn each being able to quickly save the match by breaking up numerous pin falls. Side note: I love the Blue Thunder Bomb but has Zayn beat anybody with it in the WWE? If not, why does he always get super excited when he hits it…there is no track record of success. Anyway, here is where the match went south in my opinion. Zayn reached for a tag to Owens and missed by inches, which lead Sami getting tossed out of the ring. Enter an illegal Owens into the match and looks to hit AJ with his pop-up power bomb, which Styles reversed for the pin fall (on the illegal man.) AJ Styles retains the WWE Championship, likely sending him to Mania as the champion. Here is my problem with the ending. Styles is a face and shouldn’t be winning like this. You can’t even spin it as he overcame the 2-on-1 odds, because he didn’t pin the legal man. Look, I get it this will make you watch Smackdown Live where I am sure most of my questions will be answered but the “Road to WrestleMania” is off on a rough start. At least a quick backstage confrontation with Shane McMahon will hold me over…nope. Shane admits he saw the injustice and just answers with a “yep” and moves on. Come on Tuesday! The Smackdown Tag Team Championship match could be the dark horse for match of the night. There is a lot of talent in the ring for this match. I will admit, I was never a HUGE Usos fan, but I like this version of them and am ok with them as SDLive champs. Chad Gable and Shelton Benjamin are great athletes as well and would do fine as tag champs in my opinion but that wasn’t in the cards at the Rumble. The Usos scored the first fall, which took FOREVER! A lot of near falls is great in a one-fall-to-a-finish match and I’d be fine with a couple in this match, but what we got was overkill. This match ended up being botchy at times and the ending seemed like it could have been a missed spot, with Gable missing from the ropes. I’m not upset that the Usos retained, but to beat Gable and Benjamin clean sweep like this, has me thinking of the word “buried.” I don’t like to throw that word around often but what is next for these guys? The only logical thing would be break them up and singles run…But there is nowhere on the roster for them to go currently. US Title picture perhaps, but neither would pose a believable threat to Roode. They made Gable and Benjamin look very weak here for no reason. The 30-Man Royal Rumble match was the best Rumble I’ve seen in years! This one delivered on all aspects and gave me what I was looking for. It had great surprises, comedy, action and even some storylines played into the match too. It was great to see NXT Champion, Andrade “Cien” Almas and Adam Cole (Bay Bay) get the nod to represent NXT in the rumble. Surprise entrants The Hurricane and Rey Mysterio were awesome as well. I enjoyed the comedy bits with Heath Slater getting roughed up before entering the ring, only to eliminate Sheamus in seconds. They kept Dillinger at the 10 spot, only to be attacked backstage and his spot be taken by Sami Zayn. The New Day was up to their normal shenanigans, leading to Kofi’s elimination save by plate of pancakes. I liked that there were storylines that were continued in the match. We saw interactions with Cena and Elias. Woken Matt Hardy and Bray Wyatt eliminated each other, and in some future predictions, we saw John Cena eliminate Finn Balor (who wrestled each other for a spot in the Elimination Chamber match on Raw.) There was a few things missing though. I wish there would have been a 205Live star in the match. These guys are Raw exclusive and have an hour program on the WWE Network and only 6 of the entire roster is featured on the pre-show. I would have hoped for somebody from the UK tournament to show up in the Rumble. Pete Dunn would have been great and would have been over with the Philly crowd. But I don’t want to dwell on the negatives because this truly was one of the best Rumbles I have seen in a long time. Folks, WWE actually got it right! After being in the match for over 44 minutes, Shinsuke Nakamura, who entered the match at #14 won the 2018 Royal Rumble by eliminating Roman Reigns, who entered at 28. This victory sets up Nakamura vs. AJ Styles at WrestleMania, which is a rematch of their IWGP Intercontinental Championship match at Wrestle Kingdom 10 in 2016. In what might have been the worst match of the night, The Bar regains their Raw Tag Team Championships from Seth Rollins and Jason Jordan. Here is the deal, I don’t like Jason Jordan. Not many WWE fans do. I think the kid got the short straw when WWE decided to straddle him with being Kurt’s long lost son. What an awful storyline! I complained about it on our podcast when it happened and I stand my ground. Jordan will never be able to live up to that storyline and it will doom his career. This match saw the WWE make a storyline out of a concussion, maybe not the smartest choice in 2018 and featured some of the worst selling from Jordan I’ve ever seen. Basically this was a handicapped match with Seth Rollins defending their titles against Sheamus and Cesaro solo. It didn’t help that the crowd seemed burned out by the Rumble match that they were totally dead for this bout. Either way, I hope the Rollins and Jordan experiment is over and the Bar can move into a new feud. The Universal Championship match was exactly what I thought it was going to be. A hard hitting quick match that would see Lesnar retain the Universal Championship. Wow, did you see that stiff knee that Strowman landed on Lesnar? Or how about the receipt that Lesnar handed Strowman in the form of 2 vicious rights to the side of Braun’s head. I am willing to bet Braun Strowman will never connect with a knee like that again. Go back and watch Strowman get spaghetti legs after Lesnar connected with the second right. Kane was in there to take the pin, which keeps the red hot Strowman safe and keeps the belt on Lesnar. Again, what I expected but secretly hoped for Strowman to walk out of the Royal Rumble the new champ. I am pretty sure we are getting Reigns vs. Lesnar at Mania this year. History was made in the city of Brotherly Love as for the first time ever, the women of WWE competed in the very first 30-Women Royal Rumble. As a fan of women’s wrestling, I am loving the “anything you can do I can do better” mentality of the Women’s movement. First main eventing raw (first time since Lita and Trish) to the first ever female Hell in a Cell, to the second ever female table match at TLC to competing in the first ever female Money In The Bank match up. The 30 women Rumble match will go down in history as one of the greatest moments in the Women’s Revolution. Now this match had it’s moments that I griped about, mostly all of the time spent outside of the ring. I think Sasha Banks was in and out of the ring over 10 times in her 50 plus minutes active in the match. That is something that stood out to me and most social media caught on as the match continued. I really wished we would have saw more NXT talent in this match, as it would have been a great way to introduce some new faces to the main roster fans. I know we had Ember Moon and Kairi Sane but I was looking for The Iconic Duo or maybe Shayna Baszler (Could you imagine the hype that would bring, assuming that Ronda Rousey would be in the Rumble, only to swerve the fans keeping her out) It was great to see some legends and favorites from yesteryear as well. Molly Holly, who personally was a favorite of mine, entered at number 12 and eliminated Sarah Logan. Some other greats included, Lita, Torrie Wilson, Michelle McCool, Vickie Guerrero, Kelly Kelly, Jacqueline, Beth Phoenix, Nikki and Brie Bella and Trish Stratus. How awesome was it to see these ladies again in the ring!? It was odd to have Michelle McCool so dominant in this match with 5 eliminations. Nia Jax and Nikki Bella each had 4 eliminations. Once Trish was eliminated from the match it left us both Bella Twins, Sasha Banks and Asuka. The Bella’s eliminated Banks, which cemented Asuka as the winner. Nikki eliminated Brie (which I read will set up a match at Mania – rumor with a grain of salt) and then Asuka dumped Nikki out while both were on the ring apron. Like I said, once Banks was eliminated it all but ended the match. I would have liked to see Banks and Asuka as the final two. I also understand that Asuka is undefeated, but how long are you going to run with that? If she can’t “lose” the rumble match, what match can she lose and keep her streak alive. I will admit, at this time I am also a bit bummed that we didn’t see Ronda Rousey. Charlotte and Alexa Bliss enter the ring for Asuka to decide who she is facing at WrestleMania…and OH MY GOD!!! It is happening, Joan Jett’s “Bad Reputation” rings out over the PA system and here comes Rowdy Ronda Rousey! She is sporting a shirt modeled after Rowdy Roddy Piper and wearing his leather jacket, delivered to her by Roddy’s son Colton the day of the Rumble. What an impact. What a moment to close out not only the Women’s Rumble but the show itself closes on Ronda Rousey debut and interaction with both champs and Asuka, who slapped Rousey’s hand after a hand shake attempt. Asuka gets her moment winning the Rumble, Each champion get their moment with Rousey and the WWE wins with all of the main stream news coverage this brings. During the closing seconds of the program, my phone’s ESPN alert goes off, notifying my and all of ESPN’s subscribers that Ronda Rousey has signed full time with the WWE. Monday morning, this news is covered on every sports show across America. Brilliant and great way to end the Royal Rumble. Was this the best Rumble ever? No. In fact the matches outside of the rumbles themselves bored me and knocked my grade down an entire letter. I will give the 2018 Royal Rumble a C+ Some will call that harsh, but I think it accurate. Thanks for reading and let me know what you thought. 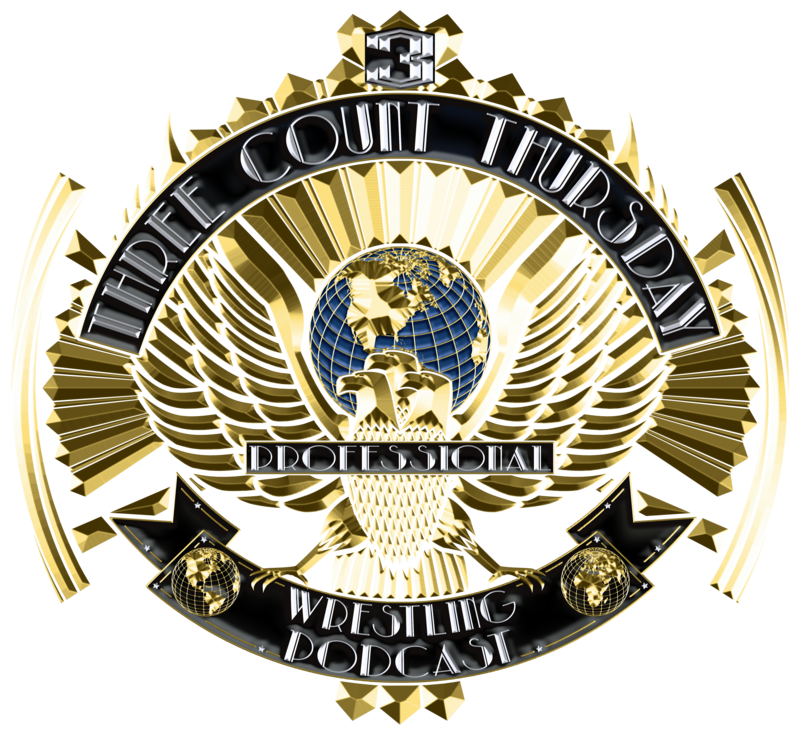 Hit me up at @ryneagle on Twitter and be sure to follow all of 3 Count Thursday social media accounts @3CountThursday.